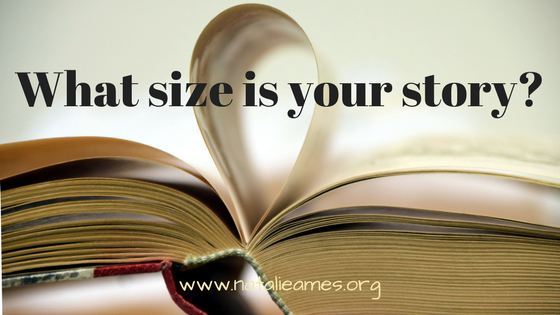 What Size is Your Story? I love movies. It’s one of my favorite things to do with my family on the weekend. Many of my children do as well, and since the youngest is heading into his tween years, we’ve been slowly introducing him to some of the great movies we’ve seen over the years. Last night it was The Matrix. He loved it. I loved it for the fourth or fifth time. We actually watched two movies yesterday, my youngest son and I. He wanted to see Thor: Ragnarok again. That movie makes me smile because Thor seems much more human in it. This morning on my facebook timeline, I noticed that someone posted a beautiful sunset/sunrise and then referenced yet another of my favorite movies, The Last of the Mohicans. I love movies for the same reason I loved books as a child. I wanted a world bigger than my own. A world that’s not so mundane, where everything is hanging in the balance, and where there is epic love and epic friendship and epic battles. In our couple’s group tonight, we’re discussing Chapter 4 of The Sacred Romance by Brent Curtis and John Eldredge. This chapter is called A Story Big Enough to Live In. Like my son and me, these two authors love movies. The authors contend that “if we’re going to find the answer to the riddle of the earth — and of our own existence — we’ll find it in story.” (p. 40) They go on to say that we “create our own storylines to bring some meaning to our experiences,” but they claim that we lose ourselves in the smallest kinds of stories. You’ll have to pick up the book for more (I promise it’s worth the read). I am 100% sure that my youngest son would say that his storyline involves some superhuman abilities and epic battles to save the world. I know I created my own storyline as well as a child, also with superhuman abilities and epic battles. Unfortunately, my story began to shrink throughout my life. But I am dreaming again of my childhood storyline and smiling, and as I do, I find it’s getting bigger and bigger. How about you? What size is your storyline? Is it epic, or the smallest kind?